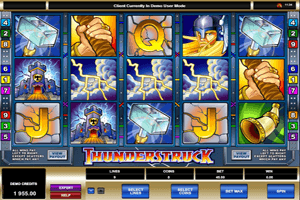 Thunderstruck is a video slot machine that is themed around the ancient Norse mythology and the gods of the Norse that were worshipped by the most vicious and powerful warriors in the world, the Vikings. The game became quite popular specially after the release of the Marvel movie, Thor. This is because the game is about Thor, his father Odin, his mother Freya and other gods from the mythical Norse gods. The game invites players to enjoy a thunderous slot experience as they spin the reels and rub shoulders with the Northern gods. The game has 9 lines and 5 reels that players can place bets on. As for the icons that are seen spinning on the reels of the game, they include the gods of the north, Thor, his mighty thunderous hammer, Freya, Odin as well as card symbols that are struck with lighting and thunder. The Scatter Rams are the bonus symbol of the game, 3 of these rams on the reels of the game will trigger the free spins bonus round that gives players 15 free spins on the game. Thor himself is the wild icon which means that whenever Thor lands on the reels of the game, he will use his godly powers to fill in for any of the other standard symbols to help players get paid by forming a winning combo. Not only that, as Thor is a generous god and he will also double all winnings he helps creating.